The Flatiron 23rd Street Partnership sponsors free walking tours every Sunday. The tours start at 11:00 a.m and depart from the southwest corner of Madison Square Park, at 23rd Street and Broadway. No advance registration is required. Professional guides will walk you through the Flatiron neighborhood (wear comfortable shoes) and you’ll learn about the area’s history and architecture. 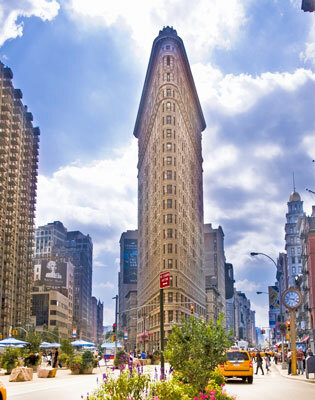 Well-known landmarks in the Flatiron District include the New York Life Insurance Building, the MetLife Clock Tower, the Appellate Courthouse, and the Flatiron Building. Visit the Flatiron 23rd Street Partnership website for details. The meeting place for the tours is the southwest corner of Madison Square Park, at 23rd Street and Broadway.